Moving is often a daunting project that involves a lot of resources, information, and tasks to accomplish. Just keeping track of everything is a significant undertaking, and one that all too often only gets stored in your head. My partner and I are in the process of moving ourselves and our two kids, and frankly just keeping everyone sane is a challenge. To help with the move, I started using Skitch to inventory our stuff and keep track of what we’re keeping (green check), and what’s being sold/ donated/ given away (red x). I can also add notes for each room, such as chores still to do and repair reminders. 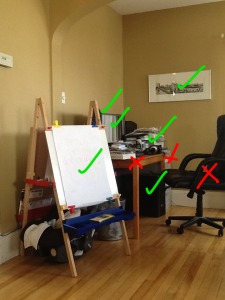 Since Skitch ties into Evernote, I’ve created a “Moving 2013” notebook to store everything in, so I now have a one stop shop for where to keep up with my move.